All parents want their kids to be as healthy as they can be. By encouraging proper eating and exercise habits, supplying structure and consistency and offering a lot of love, we all can hope to raise happy and healthy children. Mealtime shouldn’t be a battle — it should be a pleasant experience for the whole family. Kids are often picky eaters, and fussy eating can go on well past the toddler years. Sometimes even teenagers are picky about what they eat. And though you shouldn’t force your children to eat everything on their plate, you shouldn’t be a pushover and let them consume unhealthy foods, either. Parents need to find a balance. Dr. Natalie Digate Muth — a pediatrician, registered dietitian and leading expert on childhood obesity and healthy eating — is the author of “Eat Your Vegetables” and Other Mistakes Parents Make: Redefining How to Raise Healthy Eaters (Amazon, $20). She wrote this book to empower parents, and she tackles everything from picky eaters to sabotaging (though well-intentioned) grandparents. The book offers plenty of honest, practical advice for parents, and it also challenges many widely held beliefs about how to raise healthy kids. Don’t be part of the “clean-plate club.” Forcing your children to finish everything on their plate every night can contribute to both childhood and adult obesity. Making your kids continue to eat after they are full can lead to poor eating habits, overindulgence in food and unnecessary weight gain. We all need to keep in mind that even if we have a skinny toddler now, that doesn’t mean that we can allow him to develop unhealthy eating habits. Two-thirds of adults in America are overweight or obese. As with eating habits, it’s essential to instill healthy fitness habits in your children from a young age. 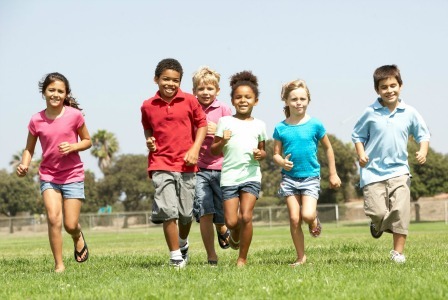 Kids who are active are happier and healthier. Get moving as a family: Kids model their parents’ behavior. You can’t expect them to want to get outside and get active if you just sit in front of the computer or the TV every evening. Make exercise part of your daily routine as a family. It’s great for your health — and for family bonding. Take a walk together after dinner every night, go bike riding on the weekend or play a good old-fashioned game of tag. Advocate for recess and gym: Many schools are skipping recess to shorten the school day or eliminating physical education classes due to budget shortfalls. It’s important for parents to advocate to maintain these programs in their kids’ school and keep their children active. Limit screen time: It’s probably impossible to keep your children away from computers, TVs and gaming systems all the time, but you should have some limits. Too much screen time can lead to an unhealthy, sedentary lifestyle. If your kids are engrossed in video games, invest in Wii games and other games that keep them up and moving. Physical health is just part of the equation when it comes to raising healthy kids. Emotional and mental health is vital, too. Self-esteem: Self-esteem issues in kids can lead to a number of serious concerns — from depression to alcohol and drug abuse to cutting and other self-harm. Criticism from parents and peers, a lack of confidence in skills or appearance, unrealistic expectations from society and a number of other factors can damage a child’s self-esteem at any age. By providing children with opportunities to succeed, offering genuine praise and communicating with them about all that is happening their lives, parents can boost their kids’ self-esteem. Praise: Though praise is critical for our children’s emotional development, you don’t want to become the parent who praises or validates your children so much that they don’t learn how to handle adversity, challenges and failures on their own. Communication: It’s important for parents to keep open the lines of communication with their children, no matter their ages. From the time kids are young, each parent should try to spend some one-on-one time with each child and take part in whole-family activities that promote bonding and communication. In our fast-paced, highly digital world, we don’t want to become so consumed with other things that we forget to take time to communicate and enjoy each other’s company. Of course, diet and exercise are key to raising healthy kids. But love, care and respect also go a long way toward a child becoming a happy, healthy adult.